Epoxy resin is useful stuff. Whether for gluing stuff together or potting components, epoxy is a cheap and versatile polymer that finds its way into many hackish projects. But let’s face it – the stock color of most commercially available epoxies lacks a certain pizzazz. Luckily, [Rupert Hirst] at Tallman Labs shows us that epoxy is easily tinted with toner powder from a laser printer or copier. Looking for a way to make his epoxy blend into a glue-up, [Rupert] also demonstrates that colored epoxy makes a professional looking potting compound. There’s just something about the silky, liquid look of a blob of cured black epoxy. [Rupert] harvested his toner powder from a depleted printer cartridge; only a smidgen is needed, so you should be able to recover plenty before recycling the cartridge. We’ve got to admit that seeing toner handled without gloves gives us the willies, though. And don’t forget that you can find cyan, magenta and yellow cartridges too if basic black isn’t your thing. Sometimes it’s better to leave your epoxy somewhat clear, like when you’re potting an LED matrix for a pendant. But this neat trick might just spiff up your next project a bit. The toner transfer method of fabricating PCBs is a staple in every maker’s toolbox. Usually, tutorials for this method of making PCBs rely on a clothes iron or laminating machine. They work perfectly well, but with both of these methods (sans high-end laminators), you’re only heating one side of the board at a time, making perfect double-sided PCBs somewhat of a challenge. [Mark] just came up with an interesting solution to this problem. A waffle iron PCB press. Technically, [Mark] is using his ‘grill and waffle baker’ as a two-sided griddle, with a few aluminum plates sandwiching the copper board for good thermal conduction. 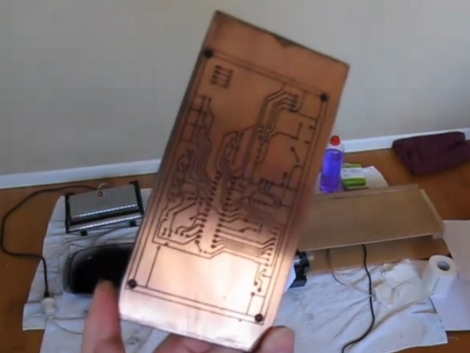 After a whole lot of trial and error, [Mark] eventually got a good transfer onto a piece of copper clad board. Now that he has the process dialed in, it should be a snap to replicate his results with a new project and a new PCB design. Circuit-bending blog GetLoFi has posted the best tutorial yet on home-made printed circuit boards using the toner transfer method. We’ve covered homebrew PCB fabrication techniques about a billion times before. What sets this tutorial apart is that it collects many bits of knowledge otherwise scattered all about the web, and then depicts the entire process on video, from initial printing to cut PCB…because reading about it versus seeing it done are two different things entirely. They give a number of immensely useful tips throughout: choice of materials and where to get them, tools and techniques, and dispelling several myths about these methods (for example, they’re adamant about not using acetone to clean toner from the PCB). Well worth the 30 minutes to watch. If that’s too much and you’ve been stuck on just one part of the process, the tutorial is in three segments. Trimming finished boards on a paper cutter? Who would’ve guessed?